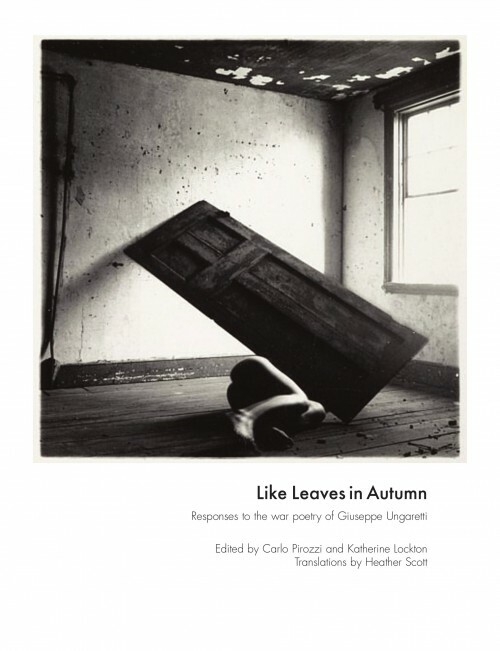 Like Leaves in Autumn is a collection of twenty one poems by Giuseppe Ungaretti translated into English, twenty one new poems by contemporary Scottish poets writing in response to Ungaretti, and twenty one black-and-white artworks from the ARTIST ROOMS collection. Carlo Pirozzi and Katherine Lockton edited the collection, with translations provided by Heather Scott, Luath Press, Edinburgh, 2015. The present publication is part of the project, ‘The Ungaretti Multi-Media War Project’ (UM-MW), led by Carlo Pirozzi. The UM-MW, intended both to commemorate the centenary of World War One and to celebrate the fifty years since Edinburgh and Florence were first twinned, is in partnership with the Italian Cultural Institute and the Scottish Poetry Library in Edinburgh and has the endorsement of Edinburgh City Council and Florence City Council. The UM-MW brings together new publications, film, animation, music and sculpture in response to poems written during the Great War by Giuseppe Ungaretti, one of Europe’s greatest modernist poets. Artworks which accompany this book have been selected by ARTIST ROOMS, which is jointly owned and managed by National Galleries of Scotland and Tate on behalf of the nation. The UM-MW will be participating in the Hidden Door Festival, Edinburgh 22-30 May 2015.